Bicyclists will enjoy touring the Rock Springs/Fairview bike trail that links Rock Springs Conservation Area to Fairview Park. 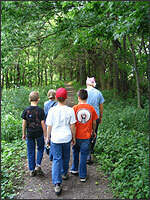 2.2 miles of trail wind through diverse habitat of forest, prairie and wetland. Hawks, deer, songbirds and even wild turkeys may be spotted as bikers enjoy their ride. The trail can also be used for hiking, running, roller blading and meets the Americans with Disabilities Act specifications. Because the trail runs through low lying areas near the Sangamon River, it is sometimes closed due to flooding. You can check for trail closure announcements on the home page of the website. 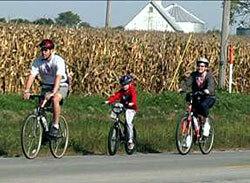 Please remember: bicycles are not allowed on the non-paved trails. Travel on the right side of the paved trail and make note of the warning signs posted along the trail for your safety. Canoeists enjoy the peaceful serenity of the Sangamon River that travels through the Rock Springs Conservation Area. A Sangamon River Canoe Access area is located just north of the Wyckles Road Bridge on the west side of Wyckles Road. Parking is provided Please remember to follow all state posted rules and regulations regarding the use of boats/canoes on the river. 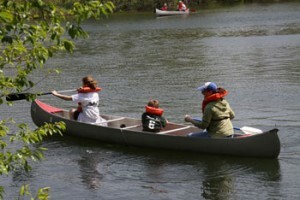 Canoes are not provided by the Macon County Conservation District. The access may be closed due to flooding. You can check the home page of this website for closure notices. The Decatur Park District manages a put-in site located just below the low-head dam on Lake Decatur. Weather permitting, Rock Springs Conservation Area offers ski packages and snow shoes for rent on a daily basis during the winter. 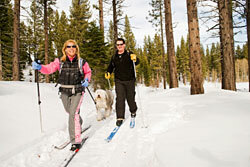 Designated trails are available based on snow conditions to ski or snow shoe through the prairies and woodlands. Wild animal tracks, winter wildlife and beautiful scenery will compliment your outing as you experience a central Illinois winter. You can check the home page for snow conditions. Trails are marked and parking is nearby to the Rock Springs Nature Center that houses the rental equipment. Skis and snow shoes are available for rental. $12.00 / 1 hour of instruction. Workshop includes one hour of rental. Two hours total $6.00 with your own skis. We have ski equipment to fit people ages 3 to adult. Snow shoes are for people age 12+. The thrill of catching a fish is a childhood memory that lives with many people. Several ponds and the Sangamon River offer the angler a chance to catch a wide variety of fish at the Rock Springs Conservation Area. Catfish, bluegill, redear sunfish, bass and even rainbow trout can be caught with a little luck. Trout are stocked in the cattail pond in the fall of the year. Fishing poles are also available on a free loan basis at the Rock Springs Nature Center. Bait and licenses are not available at the Nature Center. State of Illinois rules and regulations apply. The Rock Springs Bike Trail Pond can be accessed from the bike trail which provides a fishing dock that meets the Americans with Disabilities Act requirements and also includes interpretive signage illustrating pond life and fish that live in this pond. Try your hand at creek fishing at Friends Creek, Fort Daniel or Sand Creek Conservation Areas. Each of the district’s conservation areas offer trails for hiking including the Rock Springs Conservation Area, Friends Creek Conservation Area, Griswold Conservation Area, Sand Creek Conservation Area and Fort Daniel Conservation Area. Deciduous forests can be found at each of the district sites. Song birds, fox, raccoon, possum, wild turkey, white-tailed deer, hawks and owls can be found in the rich habitats in these protected areas. Many hikers enjoy photography of wildlife, flowers and scenery. Binoculars come in very handy for bird watchers who can find the indigo bunting, eastern bluebird, cooper ’s hawk and pileated woodpecker in many of the district areas. At the Rock Springs Conservation Area, hikers of all ages can find a wide variety of trails with beautiful forests, prairies, ponds, creeks and the Sangamon River to search for wildflowers and many species of wild animals. The Rock Springs / Fairview Bike Trail provides a paved path with gentle hills and valleys that compliment the scenery and colors of the natural areas. Sand Creek Conservation Area provides 7.6 miles of trails that include a portion of the Paris Springfield Road. The road cut can be found just south of the Mt. Gilead Cemetery and crosses the Sand Creek at the Old Trace Ford. Walk where Lincoln walked as you travel this area. He and his family traveled this route when coming to Decatur from Indiana in March of 1830. A sugar maple grove is especially gorgeous in the autumn. Friends Creek Conservation Area offers 4.75 miles of hiking trails that will lead you to the past as you visit the Bethel School. Founded in 1850s, the school served the children in the area until 1946. Beautiful views along Friends Creek await hikers. Fort Daniel Conservation Area offers hikers 4.5 miles of shaded trails along the bluffs of Big Creek. Rich, deep woods provide quality habitat for song birds and mammals including warblers, woodpeckers, owls and white-tailed deer. Griswold Conservation Area is only 43 acres in size but has a beautiful vista of the flatlands of central Illinois. Hike the trail to the overlook on top of the glacial kame and you will be treated to a view not many have seen. A short quarter mile trail will guide you around the kame through open habitat, a small wooded area and near a wetland where you might find a little green heron. A half mile tree lined lane connects the area with the Village of Blue Mound. The Sand Creek Conservation Area is a 755 acre natural area with 7.5 miles of 10 foot wide trails for horseback riders and hikers alike. Located just south of Decatur, the beautiful scenery along Sand Creek includes trees, flowers and wildlife. A $2.00 daily fee applies for out of county residents who want to ride horses on the trails. The old Paris-Springfield Road, established in 1824, ran through part of what is now the Sand Creek Conservation Area. 18 limestone parking pads measuring 10 feet by 40 feet are located at the park entrance. Each pad includes a picnic table, grill and hitching rack. 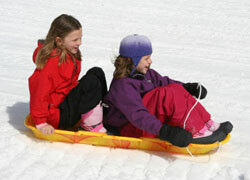 Griswold Conservation Area offers an exciting opportunity for people who enjoy sledding. The glacial kame left there 175,000 years ago is a large mound of soil and rocks deposited by the glacier. This forms a perfect place for sledding when the weather produces a good base of snow. A small warming hut is located on top of the mound. Beautiful views of the surrounding countryside can also be enjoyed by visitors who brave the climb to the top of the mound. The Team Trust Course offers organized groups a unique environment to enhance their skills for tackling challenges in school, the work place, and life in general. Facilitators lead groups of all ages through the various physical challenges of the course in order to develop group cooperation and problem solving skills. Fees and schedules vary. For more information or to schedule your group, call 217-423-7708.